The June 1st Anthony Joshua-Jarrell Miller undercard is beginning to take shape. The entire card will be streamed on DAZN. Multiple sources have advised BoxingScene.com that a welterweight showdown pitting former world title challenger Thomas Dulorme (24-3-1) against unbeaten prospect Rashidi Ellis (21-0) is in negotiations to take place at Madison Square Garden in New York on the heavyweight championship undercard. While a deal hasn’t been finalized, BoxingScene.com understands that an announcement could come as early as next week. 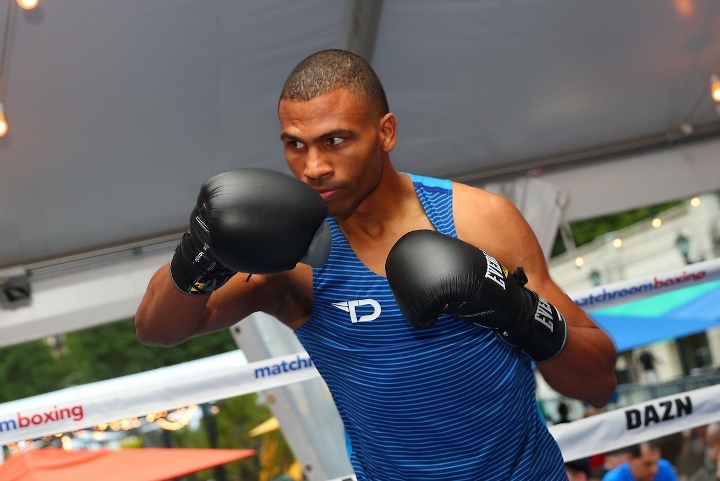 Dulorme last fought in October when he traded knockdowns with former two-division champion Jessie Vargas in the first DAZN card to take place on US soil. Dulorme rallied in the final round of the bout, to drop Vargas. The bout ended in a draw. Prior to that contest, Dulorme lose a razor close decision to Yrodenis Ugas. Ellis also last fought in October when he stopped journeyman Saul Corra in 7 rounds. The 25-year-old went 3-0 in 2018 with 2 of his victories coming by way of knockout. The stacked undercard is also expected to include Matchroom fighters Callum Smith, Kell Brook, Khalid Yafai, Josh Kelly and Joshua Buatsi against opponents to be announced. Sanchez: They Are All Using Golovkin’s Name To Stay Relevant!